It is needless to say that updating old welding processes or investing in modern technology can provide numerous benefits. A company operating in a competitive environment can’t afford to have an outdated production system to serve today’s tech-savvy consumers. Every progressive manufacturer works actively towards improving the quality of products, finishing projects faster, and reducing production costs in order to meet market demands and improve their bottom line. Forge welding was the earliest form of welding dated back to the Iron Age where heated metals were pounded repeatedly until they bond together. Today’s welding industry has developed state-of-the-art machines that have made welding surprisingly fast, accurate, and cost-effective. As one of the ideal applications of industrial robots, the welding operations have enabled manufacturers to produce highly sophisticated products for almost every industry. The automated welding units allow operators to join parts with great pace, accuracy, and repeatability without wasting resources. The continuous technological developments have made it possible for small businesses to implement modern welding operations. A successful transition from traditional welding processes to advanced wire processes can bring about a significant increase in productivity. 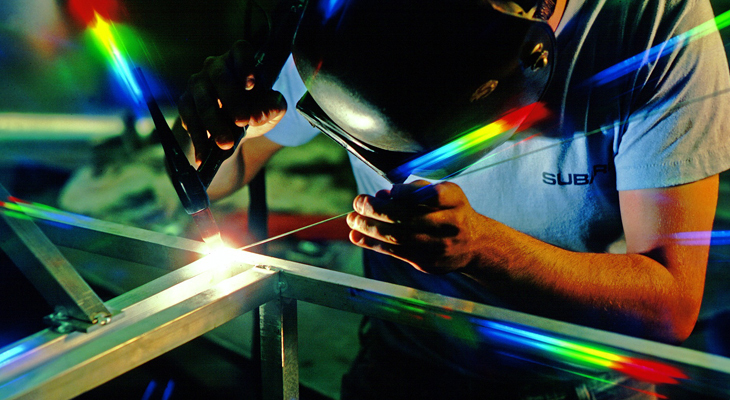 Precision and consistent weld quality are some of the prime features of advanced fabrication technology. MIG and TIG processes are commonly used by fabrication shops. However, these machines have also been designed to meet the demands of field applications. A modified MIG welding process delivers quality arc performance along with reduced operator training time. So far as MIG technique is concerned, short changeover time, higher travel speeds and deposition rates and better fusion are prime features to consider. Almost every industry has been striving to develop better and smarter technology, welding is no exception. When it comes to addressing future challenges, it is important to implement production means that can ensure increased productivity, quality, operational efficiency, profitability, and ease of use. Modern welding cells are smart and can make critical decisions. Many industries such as automotive and manufacturing implement robotic welding units that can outsmart human capabilities. For example, an automated machine can work continuously for days without compromising the quality of products. Smart machines are imperative for industries that have to perform repetitive tasks while consistently maintaining speed and quality. Filler metal selection and consistent arc performance are important when it comes to achieving fewer weld failures and higher first-time weld. Industries can save time and resources previously spent on weld failure and rework. Remember, acknowledging the need for change can be difficult as it requires dedicated and well-organized effort. Considering the ongoing developments in fabrication and machining technologies, it is vital to analyze your production processes and determine whether or not advanced welding machines will improve your bottom line. The welding technology has evolved to provide manufacturers with an unprecedented level of control. Investing in new welding solutions can help businesses resolve critical challenges. Quality Millwright provides top-notch fabrication and machining services to many industries in Edmonton. As a one-stop millwright services provider, we take pride in serving various industries with services ranging from electrical and project management to machining, and rig servicing. Visit our website or contact us for more information!